The Quick Add option is at the bottom of the same page you will create your list on. Pick the type of item you want to add. Note: If you have a premium list you have more options. Otherwise you can only add Text and Links. If you are not a Pro user, you still have three premium lists in your account. When you pick a type, you get a customized form to create an item of that type. 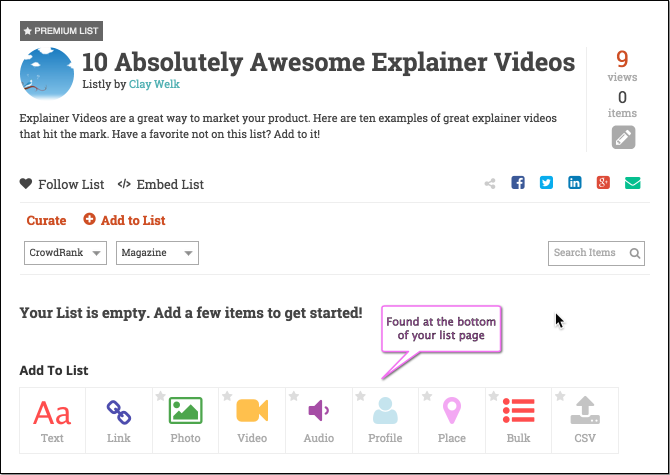 See this post on how to add various types of media to a Listly list. After you author an item, you can hit “one more” button to get more blank items that you can work on. Remember that you have not saved any of the items to the list yet. You are still authoring all of your items. Once you’re finished authoring all the items, you can hit the “Save All” to save them to the list. Note: If there are any issues with any of the items, you will see a message about the error. Fix them and hit “Save All” again.